On Wednesday, Apple will unveil something new. Apple’s not saying much yet about what it plans to show off on March 7; the invitation’s close-up photo of an iPad and its sparse text (“We have something you really have to see. And touch.”) are the only clues the company has offered thus far. If you’re a regular reader of Macworld, if you follow Apple news anywhere on the Web, or if you simply follow technology news anywhere on the Web—you already know that this Apple event is happening. (You should also know to follow Macworld’s live blog of the event on Wednesday at 10 a.m. PT to find out precisely what Apple has planned for us.) And you know that the general expectation for the event is that Apple will specifically take the wraps off a new incarnation of the iPad, sporting a much-improved display. Apple events like Wednesday’s have a lifecycle all their own, and it’s a lengthy one. For months, there are rumors about what Apple may or may not be working on—many of those rumors laughably off-base. 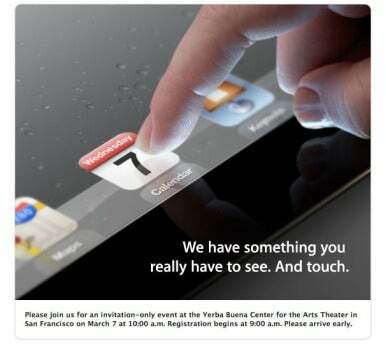 Then there are even rumors about when Apple will host its next special event to announce new stuff. News agencies rush to be first to report the those dates once they’re confirmed; even the dates of Apple announcements themselves are news. At some point, Apple emails invitations to chosen members of the technology press. Thus begins another round of mad scurrying, as Macworld, other tech publications, and broader news organizations scramble to publish stories about the invitations—and to tweet about the news, too. And then the invitation dissection begins. This time around, online debate centered on whether Apple’s invitation showcased an iPad without a Home button, or whether odd cropping, device orientation, or overzealous Photoshop work was responsible. In addition to studying Apple’s invitation art pixel by pixel, of course, pundits analyze the text as well: In our own piece predicting what Apple might announce this week, my colleague Dan Moren and I wondered whether the “And touch” line in Apple’s invitation might imply some sort of haptic feedback could appear, say, when typing on the next iPad’s virtual keyboard. On Wednesday, the rumors will stop, however briefly. That’s when Apple will actually host the heavily-anticipated event, with at least a dozen sites (including Macworld) liveblogging the showcase for huge online audiences. Major news networks will cover Apple’s announcements on their Wednesday broadcasts. And come Thursday—or, more realistically, come Wednesday afternoon—pundits will start punditing again, weighing in on the positives and negatives of whatever the heck it is that Apple pulls out of its virtual hat. Apple’s ability to dominate tech news cycles before, during, and after its special events is mind boggling, and unique not just in its industry, but essentially all industries. What other company’s special events get so much attention? The closest analogy I can think of is something like the annual State of the Union address. The press speculates on what the President will say, the President says something, and then the press talks about what the President said. It’s a days-long story. But Apple—as surprising as this may be—isn’t the leader of the free world. That it captures so much media (and, thus, consumer) attention is exceptional. Remember the Mobile World Congress? Don’t feel guilty if you’re not sure what that is. The event, hosted annually by the GSM Association in Barcelona, concluded just last week. It’s a massive mobile industry exhibition and conference—and Apple doesn’t participate. It’s not coincidental that the four-day event attracts only a mere fraction of the mind and media share that a 90-minute Apple event will generate. In skipping out on the Mobile World Congress, Apple doesn’t harm itself a whit; it scored a week’s worth of coverage by sending out invitations for an event taking place a week later. So why do Apple’s special events attract such extensive excitement and coverage? Put simply: Apple’s earned it. In general, the company—at least in the modern era kicked off when Steve Jobs returned as CEO—is fairly stingy with when it doles out these special events, and clearly aims for each one to contain multiple “Wow” moments. Remember that Apple didn’t schedule a special event to announce Mountain Lion; the company privately briefed various tech journalists in private. It could have scheduled an event like 2010’s Back to the Mac unveiling of Mac OS X Lion, and that surely would have scored the same degree of press coverage before, during, and after. But the less frequent Apple can keep such events, the more special those events become. Clearly, there’s no immediate risk of Apple Event Burnout yet, and I consider the non-existence of a Mountain Lion event a preventative measure. By ensuring that each event is, to use a favorite word of Apple’s, “magical,” the company keeps us (consumers and reporters alike) coming back. It’s not just about good marketing, good keynotes, and reality distortion: The key is that Apple continually uses its events to showcase truly amazing and innovative products. Each Apple event is only as good as the products unveiled during that event; for the most part, those products are very, very impressive. To explain why other companies can’t recreate the hoopla that surrounds Apple’s events, then, is actually pretty simple: Other companies can’t consistently create products as hoopla-worthy as Apple.